Seven years after destroying the Confederacy and most of the Union, the Jotunheim giants threaten a defenseless New England. The Army of the West plans a bold attack on Louisville to divert them. Billy McCarty’s nightmares drove him to enlist as a sharpshooter. He just wants to put his heroics in Colorado behind him and kill giants. Captain Mercer doesn’t care. He’ll use Billy’s skills and reputation however he can to ensure victory. Even if that means both their deaths. 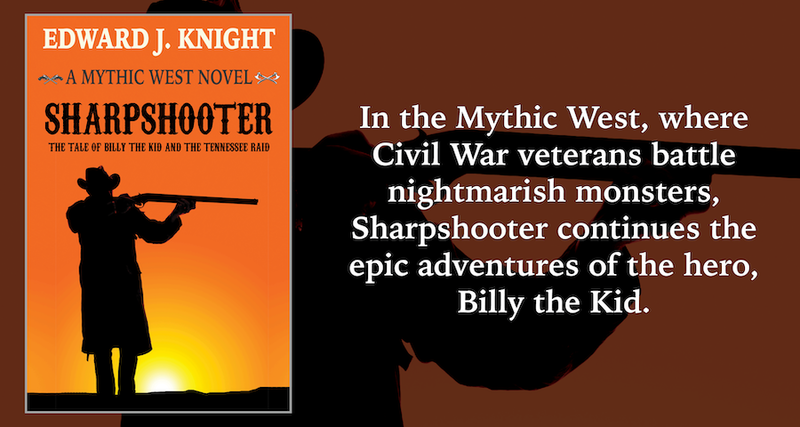 In the Mythic West, where Civil War veterans battle nightmarish monsters, Sharpshooter continues the epic adventures of the hero, Billy the Kid. Amazon in both ebook and paperback formats. Also on Apple Books through the Apple Books App. Next Post Gunslinger Beth short story published!